This past week has been more than busy with me not getting home form work until the early evening hours. 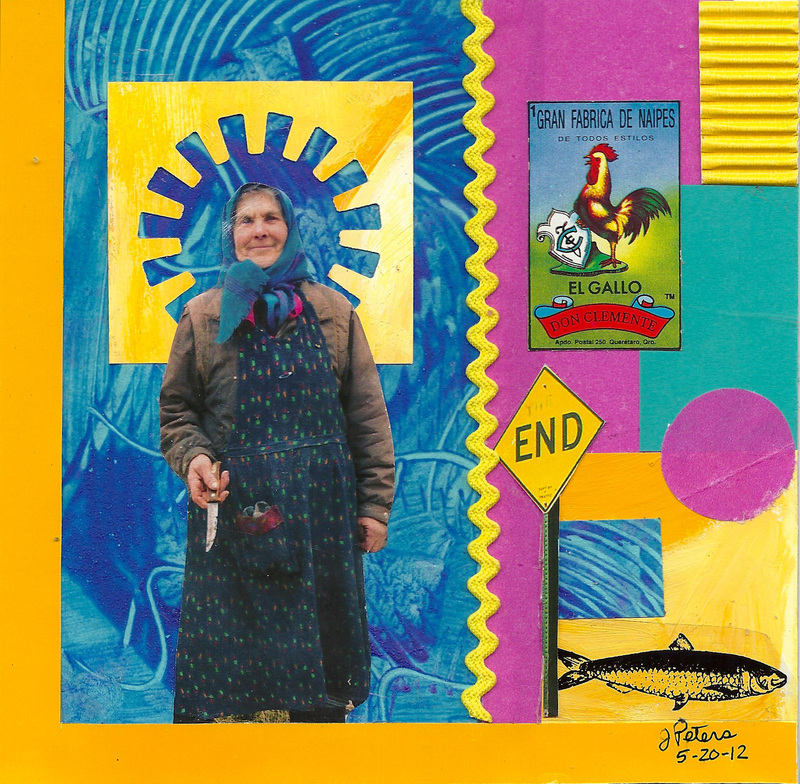 I had thought that I would try to make a few collages during the week, but the best I could do was to get one started, work on it throughout the week, and then finish it on Friday night. 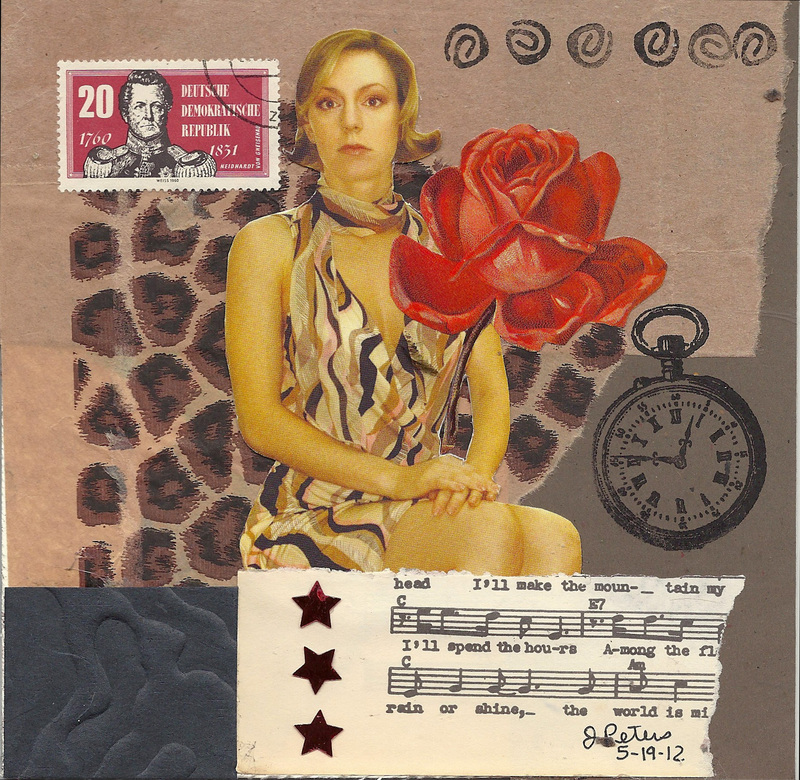 This 6″ x 6″ mixed media collage is titled “Do Not Accept”. 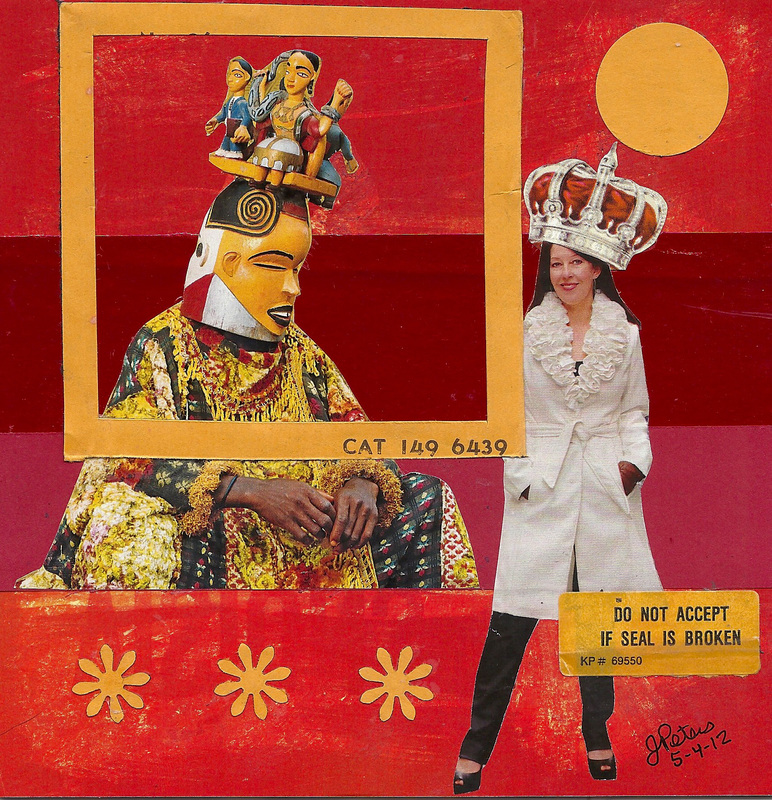 It began with a spirit figure from Nigeria and I built on it from there adding bits and pieces from an old Kodak filter envelope. I am enjoying working with the spirit figures. Saturday morning I was teaching Saturday School, so I made this collage as soon as I got home. I think it was my way of procrastinating studying for my upcoming National Board Assessment Center test. 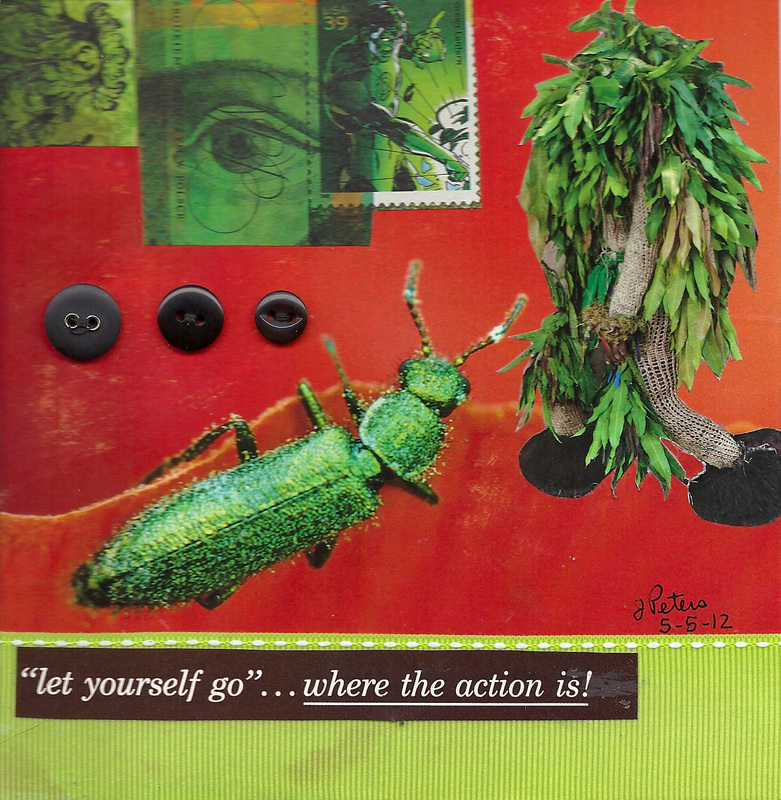 For “Let Yourself Go”, I began with a background image of this lovely green bug and then added in a spirit representing the natural world. The buttons came from my never-ending supply. Sunday morning came around and I just couldn’t sleep, was up and drinking coffee before the clock struck 6am. This third collage is probably my least favorite from this weekend. It is titled “Masquerade Without a Mask” and features young children from Haiti dressed up for the spring carnival. There can be no more procrastination today as I have a lot to do…clean the house and then…..study! Now that the house is cleaned, laundry done, and the garden watered, I was able to make a small collage. While I try to make one on both Saturday and Sunday, it just didn’ happen yesterday. Today’s began with the flamingos, which I found in a National Geographic magazine. I knew I wanted to include a girl, so I found one amongst all of my ephemera that I have. The rest of the collage just sort of fell into place. I guess I am procrastinating studying for the assessment center test as I am getting ready to make some oatmeal raisin cookies. Once they are made, however, I will crack open a couple of textbooks. I need to review the roles, purposes, and functions of non-western art so that I understand its relationship to the social, political, and historical aspects of its culture of origin. There are about 12 different cultures that I need to brush up on and should be able to accomplish most of it this afternoon. Today my thoughts are wrapped around prepping for the Assessment Center portion of my National Board Teacher Certification. 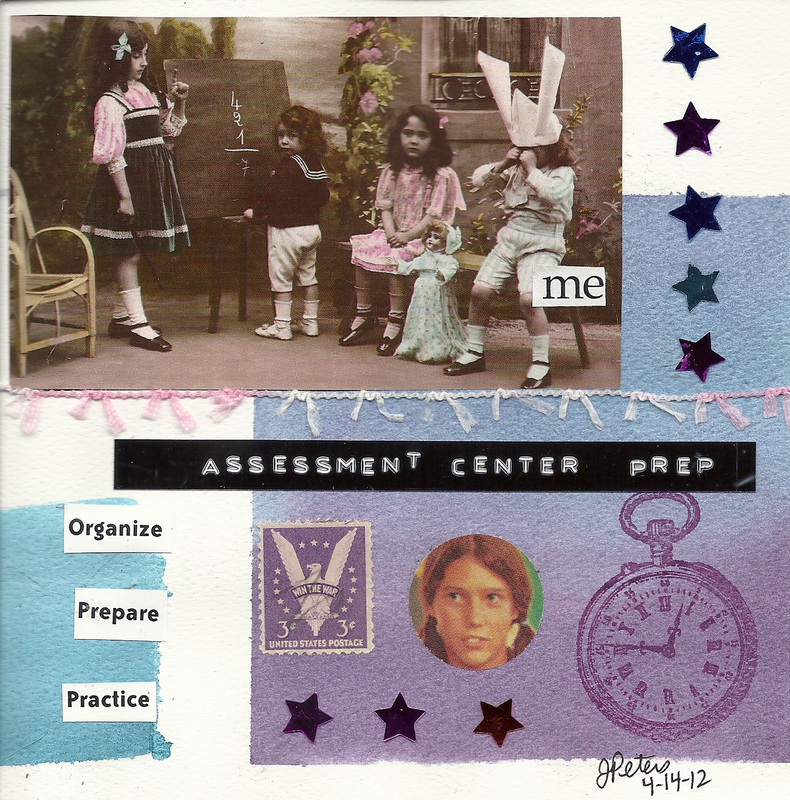 I attended the K12 Center’s workshop for the assessment and am now thinking of all that I need to do to prep for the assessment center. This collage reflects my thoughts; I am that child who is overwhelmed, yet this day has helped me focus on what I need to do to be prepared. I need to research cultures, their reasons for producing art, the function of their artworks. I also need to familiarize myself with the theories of art instrumentalism and institutionalism. Once this is done, I will be ready for the assessment center. I need to take stock in what I already know, and what I need to know to be successful in the assessment center tests. I need to be as confident in myself as others are with me. I need to say thank you to Taryl (my new BFF) and to Bobbie, for believing in me. Without the K-12 center and the individuals I have met in this National Board Certification process, I would not be the teacher that I have become. I am proud to be me. 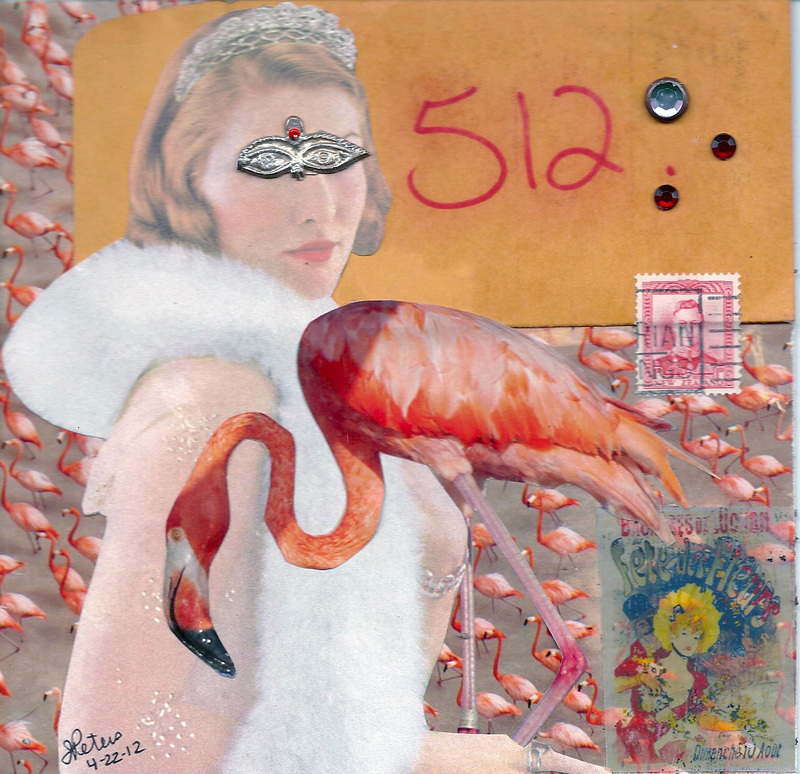 Welcome to The Life and Art of Julie Peters! I will be working on this new blog site of mine over the upcoming days to personalize it, so bear with me. 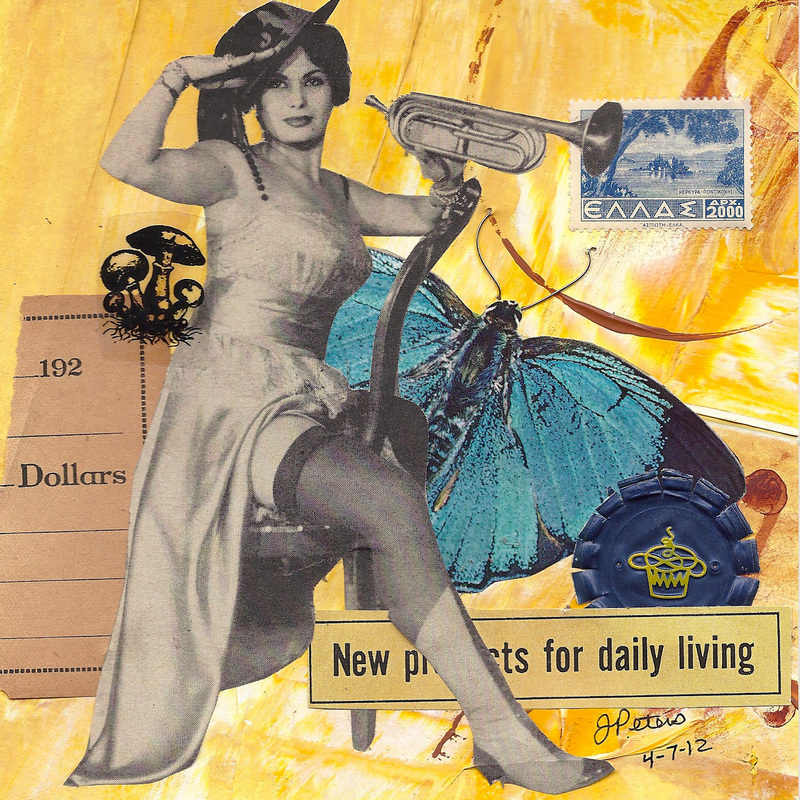 I completed today’s 6″ x 6″ collage and titled it “Daily Living”. I started with a piece of drawing paper that I had previously applied acrylic paint to. The image of the girl came from a July, 1957, LIFE magazine page. Everything else came from my never ending supply of ephemera that I have in my studio. I added the finishing touch of the butterfly’s antennae with some thin silver wire. Now I am contemplating the rest of the day. I feel uneasy, unorganized and a bit on the depressed side. I am unhappy with how much weight I have gained and know that for the benefit of my overall health that I need to loose about 30 pounds. Unfortunately, it seems so overwhelming to me right now. Because it is something that I must do, I have decided to focus on eating more fruits and vegetables while getting some type of exercise every day. This morning I spent a couple of hours cleaning house. I decided that mopping the floor and running the vacuum cleaner counted as exercise! Now if I can just get control of my sweet tooth. I will set a goal…to loose 6 pounds by the end of the month. That seems doable. The other issue on my mind is National Board Certification. My portfolios are completed and my box has been mailed and received. 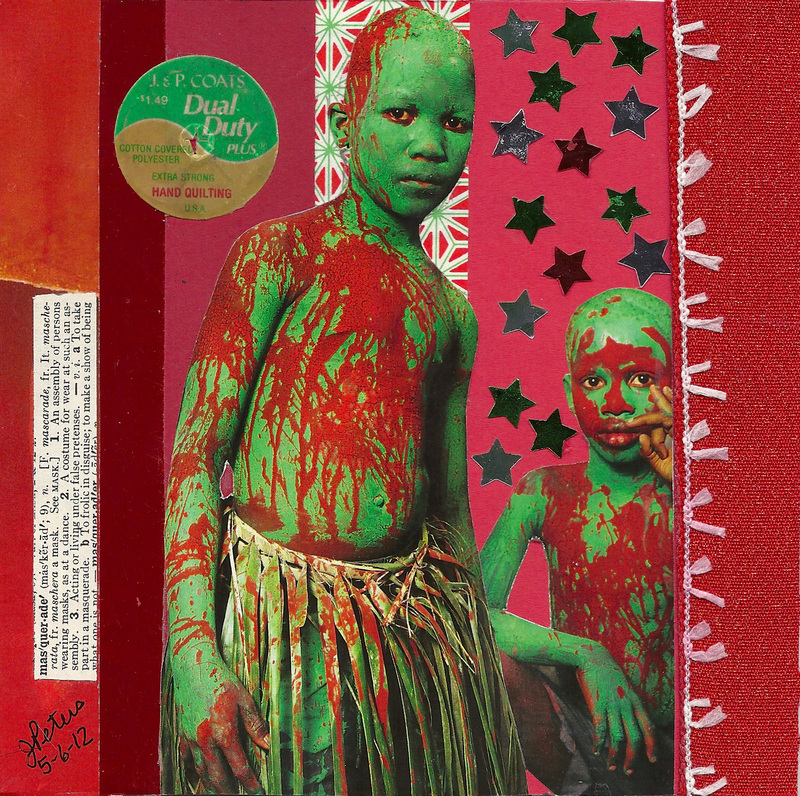 This is a 6″ x 6″ collage that I made on March 31st to commemorate the day the box was due. 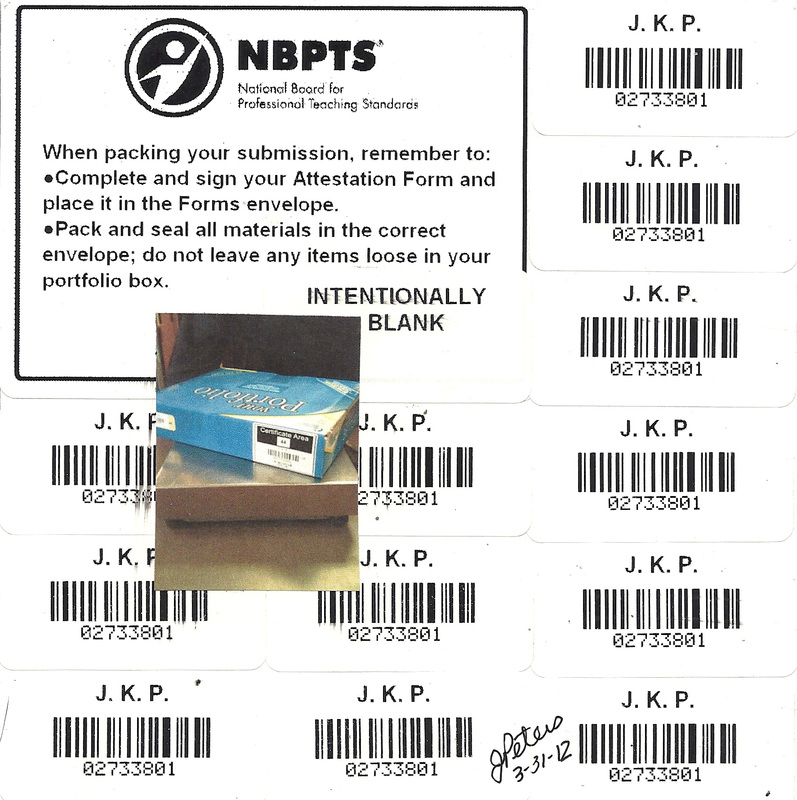 I used the remaining bar code labels that I had plus a photograph of the box I took when I was at FedEx. Now I must prepare for the assessment center tests. I did start reading “The Annotated Mona Lisa” to freshen up on my art history. I just don’t know if that will be enough and I don’t know what else to do to prepare. I am scheduled to attend the Assessment Center Coaching Saturday offered by the AZK12 center next Saturday. I am hoping that the session will push me in the right direction. My assessment center test is scheduled for the morning of May 12th. That means I have about 1 month to prepare. I need to work at staying positive.